Modern app development has simultaneously and righteously streamlined the process of app creation, be it for any operating system, or for mobile or tab devices. A simplistic yet an advanced way of creating hybrid apps with amalgamating various web technologies in a native mobile web interface (like WebView), involves Ionic framework. Ionic development is preferred for creating hybrid apps similar to like well-known Instagram, Yelp etc. With recent trends and advancements in web applications, the advent of multiplatform compatibility and universal app maintenance, the Ionic framework has made users revel in experiencing app development. For any ionic framework enthusiast, an entire curated list of advice and tricks for the consideration has been drafted below when engaging it for any app creation. This will allow for a safer, more economical and time-saving progress for any app developer. For launching projects that have been already constructed or needs customization Yeoman generator proves to be the best support tool. With Yeoman generators, you have the option of designing a new generator of your liking and project sizing or you can use a predesigned generator for a laid back, a more practical approach which does not need any system configurations to be built from scratch. 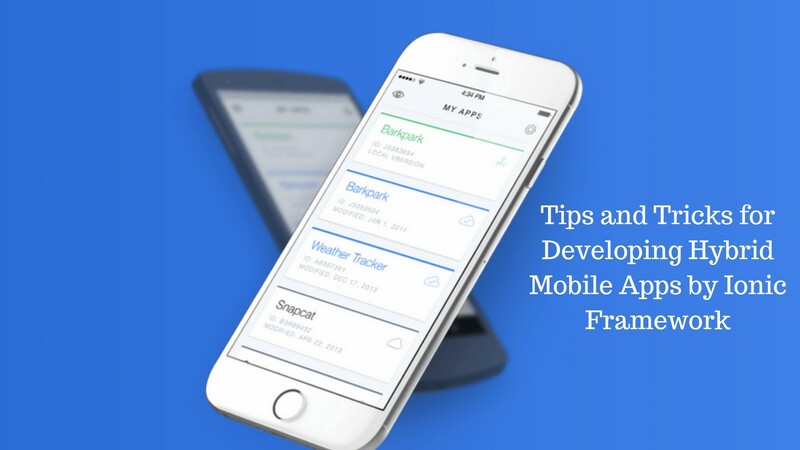 How to build your first mobile application? The ionic framework follows an angular guide system that provides components a much-needed customization with interactive support. These include features like scroll-view, collection repeat etc. Guides for implementing angular style in-app coding interface is, therefore, an important component which is available as online tutorials or in form of document sets that provides an array for approaching layout and writing of applications using ionic developer. The angular style guide can be concise and easy to comprehend or else can be detailed and specific. Whichever is required, it is important to note that since Ionic development follows angular scripting, overwriting core functions, and pathways are not desirable, only upgrade is necessary. However using style guides has its own pros, which includes experts input and knowledge which can be directly incorporated as per the need for defining new functions, code editing etc. With any app developed its important to use a right tool to test it live on a platform or an operating system. PhoneGap Developer App seamlessly launches the newly formed app onto the device and can be monitored easily with quick app debugging and remote code inspection and live statuses with any change being done. Platform Device Class is another Ionic tool which can easily integrate software with any operating system to provide a native app run experience based on the class of OS for a cross verification. Designing UX apps for mobile. Any web development tool cannot function properly without 3rd party software, plugins extensions etc., that allows any function or task to be exported or done without any tedious maneuver. Provided they are almost always free and open-sourced they are valuable, especially for the Ionic framework for hybrid app development. While deciding on mobile app design and requirements it is important to pre-install the required plugins and libraries, like Apache/Cordova plugins, Ionic plugins from the web, UI components etc. Testing tools like Protractor, Karma, and Mocha are quite useful as well and should be used for ionic development of hybrid apps routinely. It is indeed a very insightful take on whatever can be done to modernize and simplify mobile app development. With these highly cited pieces of the consult, using Ionic framework for hybrid apps can make the entire process less and less tedious and highly uncomplicated. How To Find and Hire Writers For Your Blog? Kavya Gajjar is a Marketing Manager at AIS Technolabs which is Web design and Development Company, helping global businesses to grow by Web Application Development India Services. I would love to share thoughts on Social Media Marketing Services and Game Design Development etc. Take Your Business On Mobile: 5 Ways To Create A Mobile-Friendly Web Design!